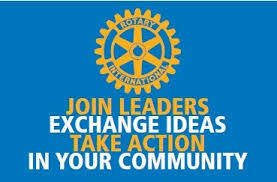 Please visit RotaryNewton.org for our meeting schedule. Rotary International’s motto, “Service Above Self” takes shape at the Rotary Club of Newton in a myriad of ways. Within our local community we help provide food, clothing, and shelter for the needy, scholarships and camperships for the young, hands-on service projects for everyone, and develop young leaders for the future as we strive to make a difference in the lives of our neighbors and community. Internationally, with the Rotary Foundation, and the Bill and Melinda Gates foundation, our efforts to eradicate POLIO throughout the world have been remarkably successful globally recognized (we're almost there!) . Because of it's work in conflict resolution and encouraging peace, Rotary even has a permanent seat at the United Nations. Some of Newton Rotary's most recent efforts include: Sponsoring & Piloting a Community-Based Addiction Education Program, Awarding a “Student of the Month” High School Community Service Award, Sending rising juniors to the Rotary Youth Leadership Awards Weekend (RYLA), Sponsoring Interact Clubs at Newton North AND Newton South High Schools, Making a Weekly Book Donation to Newton Public Library, Volunteering at the Greater Boston Food Bank and Cradles to Crayons, Cooking Valentines Dinner for Domestic Violence Shelter Residents, Running Multiple Toiletries Drives for Local Food Pantries, Awarding Scholarships for College-Bound Seniors, Awarding “Tech” Scholarships for Profession Bound Seniors, Awarding Grants to Local Community Organizations , Volunteering with “Food To Your Table” and much more! Do Good - Feel Great - Join Rotary! We're not your grandfather's Rotary! Service projects (such as raking leaves at a domestic violence shelter) are the heart of Rotary. Labeling dictionaries to give to 3rd graders.